The eighth track on ne quid nimis is “dying”. “dying” was recorded by my high school friend Erinn Thorp during the Summer of 1992. He was studying to be a recording engineer in college, and he recorded my first full length tape as a solo artist – not named by Luster – as a project, for credit, during his off time from school. This track was part of that first tape of mine, but this was a pre-mix of the song that didn’t end up on the tape. The final mix of this song had vocals and a smoother delay, with fewer “mistakes”. I like this version better. This song was directly influenced by Brian Eno. I am embarrassed to admit that in 1992 I had read a whole lot more about Eno’s ideas than I had heard his music. I didn’t have much spare money for buying albums, and there wasn’t such a thing as downloading records at that time. I had read something about Eno’s use of tape loops in “Music for Airports”, and this was my version of that idea. Frequently, when people hear my music like this, they think I make music by playing synthesizer. This annoys me very much, which is part of the reason I like to list instrumentation, and also is part of the reason that I’m doing this series of blog posts. This is a guitar piece, with a lot of natural sustain, and with a fair, but not outrageous, amount of delay. I ‘wrote’ the song by choosing six notes to be played on the guitar. The performer takes one of those notes and performs that note and only that note for the length of the performance. The note is played by striking the string with the volume pot all the way down, then fades it in slowly using the volume pot. This gives every note a slow attack, unlike your typical sound on guitar. The note is allowed to sustain, and then followed by a silence at least as long as the note’s duration, but subject to the whim of the performer. Once all six notes/parts had been played and recorded, the recorded material would be fed through a delay unit. The guitar parts were recorded to 3 tracks of a 4-track tape recorder. Erinn and I played the 6 guitar parts. Erinn did me a great favor by recording my music at this time, and I’m very grateful for that… but he also did me a disservice, by keeping the masters of the project for this class. Currently the master tapes are completely lost. Lesson learned: an artist should always own the masters to his work. 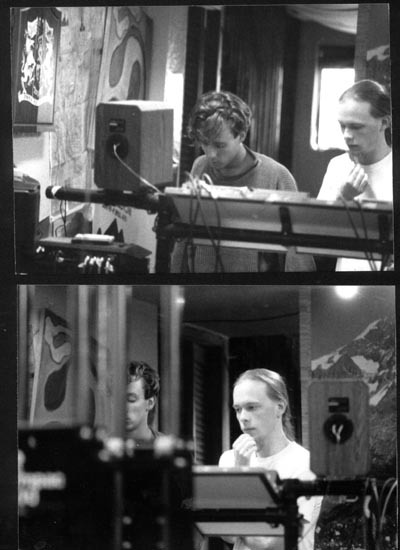 Those photos remind me a lot of Eno.